* The Toronto Stock Exchange's S&P/TSX fell 20.54 points, or 0.13 percent, to 16,167.56. * Leading the index were Westshore Terminals Investment Corp, up 11.8 percent, Crescent Point Energy Corp, up 9.5 percent, and MEG Energy Corp, higher by 9.5 percent. * Lagging shares were BRP Inc, down 3.7 percent, Bausch Health Companies Inc, down 3.7 percent, and TFI International Inc, lower by 3.6 percent. * On the TSX 125 issues rose and 114 fell as a 1.1-to-1 ratio favored advancers. There were 9 new highs and 2 new lows, with total volume of 261.7 million shares. 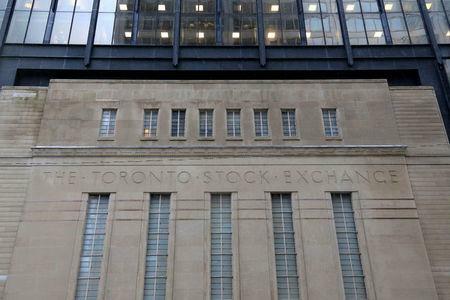 * The most heavily traded shares by volume were Aurora Cannabis Inc, Manulife Financial Corp and Crescent Point Energy Corp.
* The TSX's energy group rose 3.10 points, or 2.0 percent, while the financials sector slipped 2.15 points, or 0.7 percent. * The TSX is up 12.9 percent for the year.